Accidental Brilliance: Zum Zum Good...An Accidental Brilliance Favorite. Zum Zum Good...An Accidental Brilliance Favorite. Making sure that everything that goes on the skin is all natural is super important. Did you know that by the time you leave the bathroom in the morning you have lathered up, absorbed and inhaled up to 100 chemicals. And when you're taking a relaxing hot shower or bath, the heat is helping to open up pores so whatever chemicals are in the soap and cream you are using are more easily absorbed into your bloodstream. Handmade all natural Zum Bar soaps are a real favorite, the rosemary-mint, sea salt and almond are top picks but, they all smell great. The entire line which is more than just soaps is 100% natural and 100% awesome. 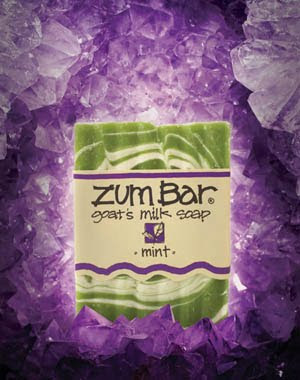 The soaps are made with a base of goat's milk which offers a pH level almost identical to your skin which means they never dry your skin out...that and the pure essential oils in each bar leave your skin super soft and smelling amazing. Whole Foods has a good selection or check out their website here. Promise this stuff is good.